Wow. I typed the title then thought–I got that wrong. Kaitlyn isn’t coming up on six. Surely not. She is! Kaitlyn has gotten much better about trying new foods recently. I think our rule that you can’t say “I don’t like it” at the dinner table has helped a lot with that. She will eat things I never would have thought she would ever try (at least until teenage years or adulthood). That’s not to say she never has a picky moment–she does. But she is improving steadily. I did make her a quilt for Christmas that matches the room–it is a Hello Kitty quilt. She loves Hello Kitty. It is perfect because it is red, which matches Brayden’s room, with some pink and white so it adds some girly flair for her space. Kaitlyn’s favorite thing to do is anything involving art. She loves paper, pencils, markers, crayons, scissors, and glue. Here is an example. For Christmas, Kaitlyn’s teacher asked parents who could to donate something gender neutral for the kids in the class. I thought about it and settled on a pad of sticky post-it notes for each child. That was hands down Kaitlyn’s favorite gift. I have coined the phrase. She still has it at times. She is just perfect at school. Then she comes home and seems to need to relieve some of the stress she must put on herself from trying to be so perfect at school all day long. It can be so odd. She is by nature a very sweet and happy person. She is loving and a peacemaker is something that describes her well. But she gets these diva moments that just seem like she has been replaced by some 15 year old girl with an attitude. Time will tell how normal this is for girls. I really think it is highly the stress she puts on herself at school because when there is no school, she is fine all day. Kaitlyn is the type of person to notice a need and do her best to help out. 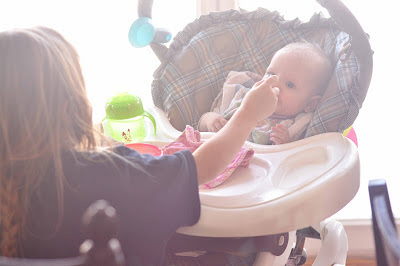 One day at breakfast time, I was about to feed Brinley when she said, “Mom, I will feed Brinley so you can eat breakfast.” (that is the picture above) It was so sweet. She is a good help. School is going really well. She loves to learn and is very good at school. She is not in the same class as her best friend. She has been surprisingly hesitant to want to play with any other children other than him. She interacts well with the other kids and gets along well with them, but at recess she doesn’t want to play with anyone other than her best friend. Her teacher says she is improving a lot, but I assumed she would be more “over it” by now–meaning I would have thought she would have adjusted to the change and not always waiting for him to play with at recess. I definitely have no problem with her having a best friend, but I also think it would be good for her to be good friends with lots of kids. I am not sure exactly what if anything I can do, but I am thinking on it. 7:00–wake up. Eat breakfast. Get Ready. Free Play until school. 3:00–Practice piano and homework if she has it. Time with Mommy. That is interesting about your theory about the kindertude attitude. I can see how you think it is possibly stress pent up from the day that is just being released….never thought about it that way but it makes sense. DD1 never gets in trouble (thankfully!) and I think she is on good behaviour so maybe that is some? In general she's fine but yes she sometimes cops an attitude and i'm not sure where it comes from. On winter break and days off it seems fine. They all play well together,etc. After a school day the older 2 bicker a lot instead of playing nicely. I point out they haven't seen each other all day and wouldn't it be nice if they play nicely,etc…..it seems like days they are off they often bicker less go figure! (although DD1 tends to boss DD2 around in general) But maybe it's what you said! They just have a full day and are somewhat stressed by the day's end.One question, when did you start Kaitlyn's piano? I am not sure if i missed that. i knew you started Brayden a while ago. My DD1 is almost 6 and i'm thinking of starting her soon but don't want her too young as she has such a full long day with school. Just curious your thoughts on this age. I definitely think elementary age is good before they get so busy they don't have time to practice but i heard they should have hands big enough to make a full octave,etc. I definitely disagree that they need to make a full octave. The songs for young beginners never get that far, first of all, and second of all, my hands can barely make a full octave, so I would never qualify for that requirement 🙂 We start piano when they start Kindergarten, so she started in September. She has played in G position and C position, but never more than five notes at once. I would talk to whatever teacher you would use–around here I think most kids start around 1-2 grade. Val — As a music teacher at an elementary school… I can tell you that kindertude is REAL! 😛 I think some girls have it more than others, but I've seen what you describe even in my students — one second they're sweet and loving, next minute there's attitude like a teenager!Michael and Yvonne — I'm a music teacher and my mom's a piano teacher. My mom's preference is 1st grade for starting piano. In her experience, that's a good age for attention span, and they're starting to understand reading better so it's easier for them to learn to read music and practice more independently. I know she's not concerned about reaching an octave, if that's what's holding you back. Thanks for the thoughts. I was thinking 1-2 grade range so that seems to line up. I think that makes sense about the reading better so it's easier to learn the music as it's a lot to process all at once otherwise. My son had kindertude for sure. He was great at school and then seemed to dump all negative emotions and "tired behaviors" on me right afterward. During school vacations and summer time, he was very sweet for long periods of time without having that attitude. I am glad she is not the only Kindertude person out there 🙂 Interestingly, Brayden did not have this. He must not be such a social perfectionist…definitely not 🙂 Thanks for the music thoughts Sarah! Yvonne, the teacher will use a certain book–ours uses Alfred. Alfred has a great early beginner book set. I would imagine most would. If not all.